Terratec T5 Dual DVB-T Satellite Receiver, The TerraTec T5 is a compact TV stick with two receivers for best DVB-T reception in fringe areas and during the journey for quality conscious users. 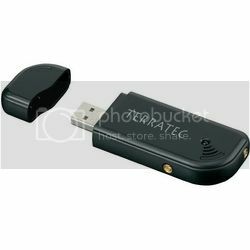 Simply plug it into an available USB 2.0 port, the handy stick transforms netbook, laptop and desktop computer into a full-function television with full HDTV support with many additional features. Magix Movies on DVD TV Edition.